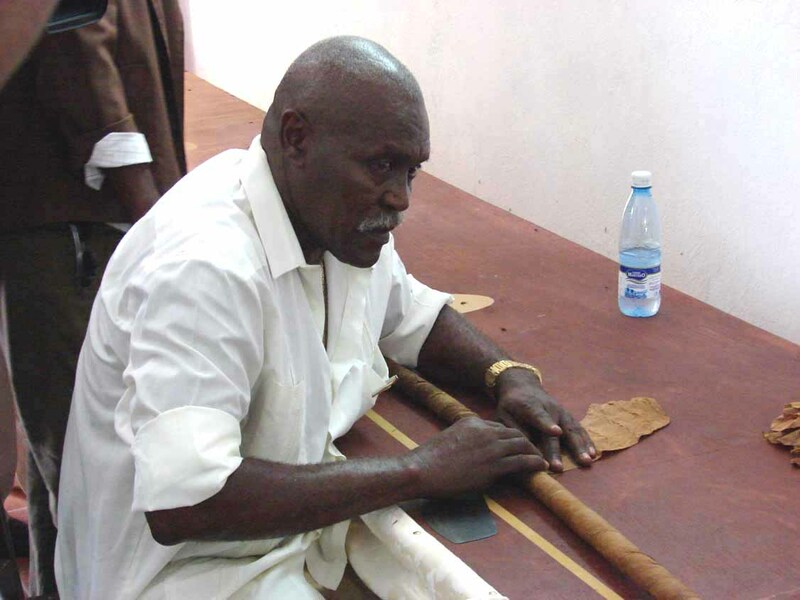 Cuban cigar-roller Jose Castelar Cairo (Cueto), already famous for his four Guinness World Record length cigars (11,04 m, 14,80 m, 20,41 m, and 45,38 m Habanos), will be shooting for a new world record this Monday, April 25th.In the Morro- Cabaña Park in Havana, Cueto will set out to roll a 70 meter-long cigar. Cueto, with 50 years of experience, recalls with satisfaction the knowledge he got on his way through prestigious cigar factories like La Corona, Partagas and Briones Montoto, the producer of the Romeo and Julieta and Cohiba brands, among others. He also remembers those who revealed to him some secrets in this art, and mentions cigar-roller Eddy Garcia, who taught him to make twisted cigars. 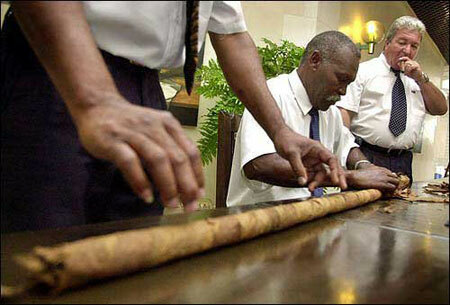 His previous Guinness World Record cigars are on display at the fortress of San Carlos de la Cabaña in La Triada. Cueto is planning to exhibit his cigars at the 31st International Tourism Fair (FITCuba 2011) this May 2nd-7th. This past year Cueto was nominated to receive the prestigious Premio Habano. Cigar enthusiasts everywhere will surely wish him luck in pursuing his next Guinness World Record! The series based on Gaiman’s 2001 novel would showcase his new pantheon of deities based on American culture. The details are scarce, but HBO is currently in talks to write and film a pilot for a new fantasy series. Interestingly, the series would be produced by Playtone – the outfit of Tom Hanks and Gary Goetzman who made Big Love and Band of Brothers. Gaiman first gained notoriety as a comic book writer with his Sandman series in the late eighties but he’s since branched into writing novels, short stories and movies (Beowulf). Gaiman’s works are no stranger to adaptation as his novella Coraline become the 2009 animated film and his Graveyard Book is also tapped to be a feature film. No one knows who would write the script for American Gods or when production would begin, but it seems that HBO is becoming more interested in genre content with the success of True Blood and the imminent Game of Thrones. The main character in American Gods is an ex-convict called Shadow, who starts working as a bodyguard for a mysterious con-man named Mr. Wednesday. As Wednesday travels across the United States meeting with strange people, Shadow eventually figures out that his employer is an incarnation of the Norse god Odin and that he is recruiting other mythological figures whose power has diminished to fight a war against new American “deities” such as the Internet, media, and mass transportation. Typically I don’t watch a lot of telly but I really have to take my hat off to HBO who in recent years have pumped out some absolute crackers; Sopranos, Boardwalk Empire and Six Feet Under to name a few. Having watched the first episode twice so far it seems that Game of Thrones is set to be another classic and if they do even half as good a job with American Gods it will be outstanding. I love Thai flavours and think that they work absolutely brilliantly with fish and seafood. 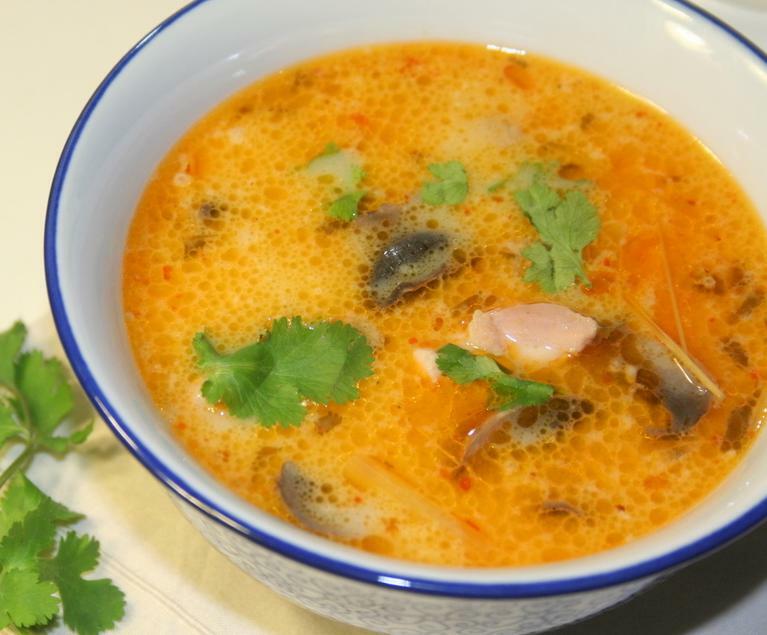 This Thai soup recipe has delicate spicing that allows the fish to really stand out coupled with a subtle kick of background heat that you will love. I have used a combination of scallops and salmon in my recipe but it works just as well with prawns, cod, squid in fact any fish or seafood that you can think of. remove the tough outer layer from the lemon grass and add to the pan along with the lime leaves which can be shredded up and added along with the vegetable stock, tomato puree, fish sauce and light soy. Give everything a good stir, add the red lentils and coconut cream and allow to simmer for about 15/20 minutes. Remove the pan from the heat and allow the soup to cool. Once cooled ladle the soup into a blender and blend until you are left with what resembles a thick puree. Force the puree through a fine sieve into a sauce pan and then return what is left in the sieve to the blender along with a further pint of water. Repeat the process of forcing the puree through the sieve and once you are sure you have extracted all the liquid discard the solids that are left behind. At this point you should have a lovely rich, smooth Thai soup that is perfect by itself but even better with some fish or seafood added in. Return the pan to a low heat and allow it to simmer, chop you salmon into small chunks and added to the soup to cook through gently. You will now lightly pan sear the scallops to make sure they are cooked through perfectly. If you have large scallops you can chop them up a little but otherwise add them as is to a small pan with a little olive oil. They only need 1 minute each side to ensure that they are just right. Once the scallops have cooked add them to the soup and allow to simmer for another 3/5 minutes before serving. 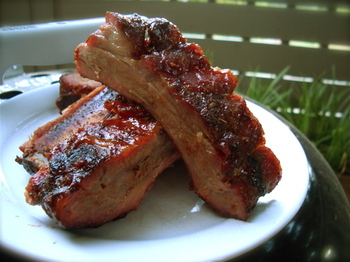 This is a really great recipe for quick and easy pork ribs in a delicious sweet and smokey BBQ sauce that works great with pretty much anything. It is really easy to tweak the sauce to suit your own personal tastes, a little more sugar or some honey if you want it sweeter, a little more chilli powder or some dried chili flakes if you want a bit more heat. If for some bizarre reason you don’t like pork you can just as easily use beef ribs and they will still taste delicious. Mix together all of the ingredients for the bbq sauce in a large saucepan, and simmer 20 minutes. Allow the sauce to cool and baste the ribs liberally before placing into a low oven, cook for approx 4/5 hours or until the meat is really tender and nearly falling off the bone. Every hour or so re-baste with a little bit of the sauce to keep the ribs nice and juicy. America’s Most Hated Family In Crisis is a follow-up to his acclaimed 2007 documentary The Most Hated Family In America, and sees Theroux return to Topeka, Kansas for a second visit to the Westboro Baptist Church. A fire-and-brimstone Christian group, made up of 80 members of the Phelps family, has garnered worldwide notoriety thanks to their funeral picketing of soldiers killed in action. Believing they were killed as God’s punishment for America’s toleration of homosexuality, the family wield anti-gay placards while singing their own disturbing lyrics to Lady Gaga tunes. In the four years since Theroux’s first documentary, a series of defections of family members has shaken up the church. They’ve also been at the centre of a landmark supreme court case (the court ruled that vicious anti-gay rhetoric was constitutionally protected) and their beliefs have become increasingly bizarre. For Theroux the story has moved on, which is partly why he wanted to return. That and the fact he admits he’s “fascinated” by the Phelps family. “It sounds really odd to say this but there are aspects of them that are quite nice, given how hateful they and the pickets are,” he says, adding he found his attitude towards them “modulated”. “When you’re on the pickets you find yourself shocked and sometimes upset by what they’re doing, and then at other times you see them as normal people. The challenge is to try and manage your reaction,” he explains. The documentary is being broadcast tonight at 9pm on BBC2 – make sure you tune in.